Education reformers Deborah Meier, Theodore Sizer, and Nancy Sizer have published books that are acknowledged classics of education writing-books that have literally helped shape a movement centered on small schools, community, and alternative visions of teaching and learning. But as school principals, all three have also done another kind of writing, as well. Every week as principles they wrote short essays in their schools’ newsletters to families. Sharp and accessible but intellectually ambitious, these little essays talk about everything from homework to discipline, from academic expectations to reading for pleasure. Keeping School collects the best of these gems from the two schools the authors have most recently run: an urban public elementary school in Boston, and an exurban charter secondary school thirty miles west in Devens, Massachusetts. 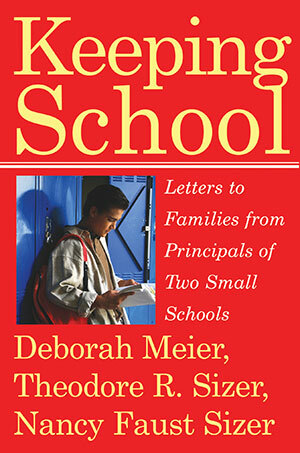 There could be no better portrait of the kind of small school that Meier and the Sizers advocate-and the values behind them-than these elegant, thoughtful, intimate letters. They are organized around the themes of Authority, Community, Learning, and Standards, and the writers, who have been friends and colleagues for years, frame them with new essays on those larger topics. Reflecting decades of practical wisdom, this collection is a portrait of a different way of’keeping school’ and an essential companion to books like Ted Sizer’s Horace’s Compromise, Ted and Nancy Sizer’s The Students Are Watching, and Meier’s The Power of Their Ideas.